The MaxiMist Allure Spray Tanning System delivers powerful results and a subtle sound for the best spray tanning experience. 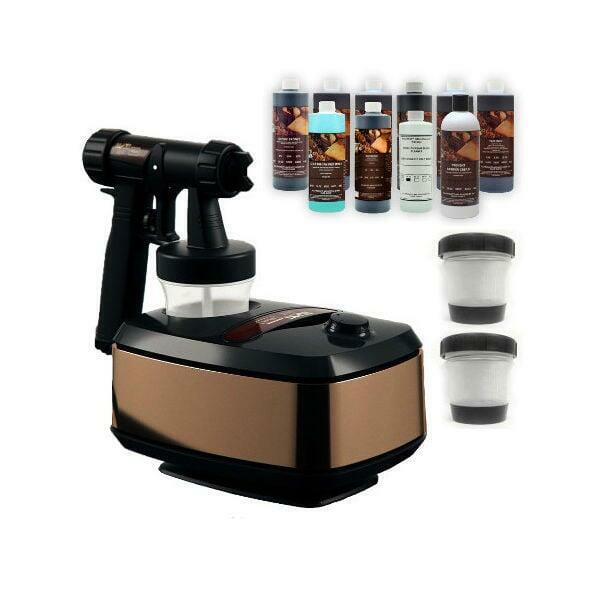 The spray tan system includes the entire system to deliver spray tans including the turbine filter, cup gasket, solution tube and spray gun, plus a sample solution package. The MaxiMist system boasts the satin air spray gun nozzle technology that gives outstanding atomization for perfect coverage. The flow control is fine and precise so that the tanning applicator may enjoy perfect contours and more. The spray gun and hose connection is twist and lock for a perfect connection. The package is attractive, with gloss black surfaces and metallic finishes for a high-end look, and it is easy to carry and transport, with a retractable hidden carry handle, on board spray gun storage and on board power cord management. The MaxiMist Allure offers an ideal tanning experience both for the spray tan technician and the spray tanner. We offer free shipping on all orders over $40 in the contiguous United States. Orders under $40 will incur a flat $5.99 Shipping Fee. Most tanning bed supplies ship via UPS / Fed Ex. Most delivery times within the Continental U.S range from 2-5 days depending on location.